Modern Beauty Girl: Apparel Candy Summer Wishlist! We are in the midst of a very hot summer, and I wanted to share some summery fashion and beauty products that I'm lusting after! This post is sponsored by Apparel Candy, a wholesale clothing company. First up, here's my beauty and fashion wishlist! This is a wholesale clothing store, so lots of the clothing items and beauty products are only available to purchase in bulk. This makes it hard to buy clothing unless you're running a store, but the bags are all able to be purchased as singles, which is amazing! The bag in the collage is my personal favorite because it screams "festival" to me, but there's a crazy amount of variety! Also, everything's so inexpensive that you can buy lots! I also love the idea of buying eyeshadows or lipsticks in bulk and giving them away as presents or stocking stuffers during Christmastime! Now here's some sunglasses I'm loving! 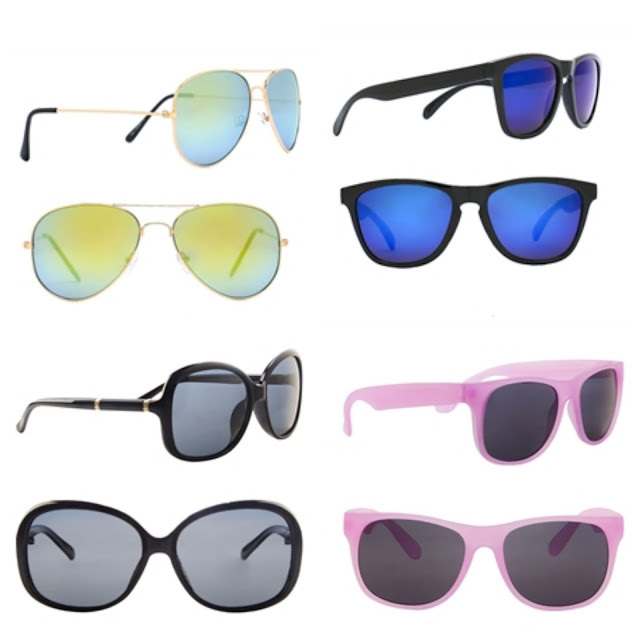 These wholesale sunglasses are amazing! Sunglasses break so easily and these ones are so cheap, that it's perfect for throwing in your bag! All of these are so cute, and they have a great sunglass collection, so you can find anything you want! Let me know what items are on your summer wishlist in the comments down below! Also, if you make a purchase off of Apparel Candy, let me know what you get!